It was interesting talking to Roshan Ranawana at a time he smiles down on us from massive billboards announcing blockbuster movies. He is a heart throb; no doubt about that. He has the kind of dashing looks in real life to stir the heart of women no matter what age. Maybe it’s this God given great good looks and amazingly well groomed figure that had lifted him up on a throne he reins today. I believed he has more than looks and probed for clues. He is a hero on the silver screen. His latest film about youth in love chasing butterfly dreams, running to packed houses in Colombo circuit is bound to expand his fan base Suwandha Danuna Jeewithe has the potential to make it big. Pooja Umashanker and Roashan make an amazing pair on screen. They look so great together that his fans wonder whether all these lovely love scenes are for real. I too was induced to find out. “You ask Pooja about me. She is bound to tell you I am like a brother to her,” he blurted. “I don’t have any intentions other than making a good portrayal of the role given to me and she does the same. She is a great actress and is very supportive. She is a good friend and it’s a lot of fun working together. There is nothing more to our relationship than being just good friends,” he convinced me. He sounded genuine and there is this kind of childlike quality in him that is very appealing. I personally believe that we all should retain some part of childlikeness in us till our last day. Our environmental influences eat up the best part of us as we grow and we become shaped and reshaped to fall in line and blend with the backdrop we live in. If we could stay aloof it would be incredible and here is a person who is that much amazing; Roshan is amazing. His fans know best. “I value the freedom I am enjoying now and hope to maintain it that way. I don’t have marriage in my head right now. Maybe if I meet the Miss Perfect I might fall head first. I am a kind of perfectionist. Not in a stiff way but I expect a 50-50 give and take from both ends. Understanding each other is the key to any relationship. I would like my wife to understand my dedication to film as its my career and not infuse rules and regulations that make me uncomfortable. I would try my best to understand her in the same light,” he insisted. Isn’t perfectionism a mirage to pursue I queried. He said that perfectionism may sound a harsh word to use but, similar outlook in life, similar mindset, liking the same things, having similar standing in life, will help and always strengthen relationships. Looks are important in life to move ahead. Personality more so. Refined mannerisms, caring for the people around you and good breeding is what makes people, lovable. I am not looking for riches. But good values and good life practices are what adds value to life’ he said, showing more character than what meets the eye. I thought he looks best when he is serious. “I had a very colourful life since I left Asian International School straight on to the ramp when a teacher introduced me to Ramani and Micheal Wijesuriya who signed me in for a bridal show in 2001. 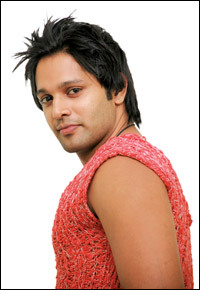 One good thing leads to another and I was crowned Mr. Sri Lanka in 2002. I went to China for Man Hunt International and was placed seventh, first time Sri Lanka made it to top ten in an International Peagent for men. The feeling was wow!” he said spontaneously. “2003 took me to London for Mr. World and to Turkey for Best Model of the World and was placed third. I also won the Best National Costume award wearing headgear weighing 5 kilos. It paid off! In 2006 I was placed eighth at the Mr. International, Singapore. I have maximized on God-given blessings representing Sri Lanka in most number of pageants.” He sure has mastered the art of balancing brain and brawn! Roshan may look like a dream right now, but he too has a dream for his tomorrow.